There was a small neighborhood bakery near my parents' house in Jakarta. It was so small, I don't think it even had a name. It was practically someone's living room, and they baked their delicious goodies in their own family kitchen. But one thing I remember fondly, out of many scrumptious pastries, cakes and buns they produced, there was Sausijzenbroodje. In my attempt to reminisce my childhood, I was searching for the recipe and happened to acquire one from a friend in Indonesia. The original recipe for the puff pastry calls for lard, but I decided to try different recipe that uses butter instead. I found the amazing recipe and easy to understand tutorial from this fantastic blog, tried it and was successful on my first attempt! Could not be happier! Prepare the dough packet: Put the flour on the kitchen counter, make a well right in the center. Mix salt and water until the salt is completely dissolved, pour this into the well. Working from the inside wall of the flour, mix the water and flour using a fork until the flour is all stirred. Add melted butter into the mixture and continue stirring, adding a little bit of water if necessary. Hand knead the dough for about a minute or two, shape the dough into a 6" x 10" rectangle, wrap with plastic and refrigerate for at least 2 hours. Prepare the butter packet: Using mixer, cream the butter until soft, then add the flour and blend together. Lay a piece of plastic wrap on the kitchen counter. Spread the butter mixture directly onto the plastic wrap, shape into a rectangle that's about the same size with the dough rectangle. Wrap with plastic and refrigerate for at least 2 hours. For the instructions on how to roll and turn, please visit here. You cannot get better explanation elsewhere. Thaw the puff pastry if frozen. Cut into 4" squares. 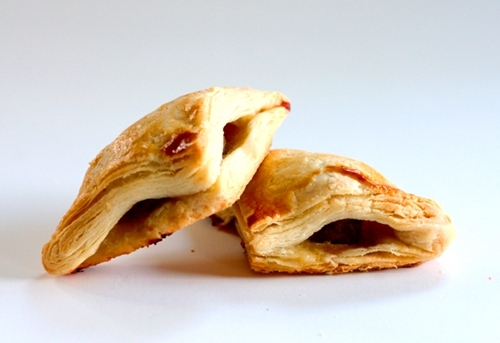 Put about a teaspoon of meat filling in the middle of the pastry, fold over and press the edge with fork to seal it. Repeat the process with the rest, transfer to lined baking sheet. Brush the top of the pastry with the egg yolk. Bake for about 20 minutes, or until golden brown. Glad to find a recipe for homemade puff pastry here! I personally think that purchased is kind of greasy, unlike the wonderful flaky display you have here! I also like the savory filling recipe. The combo no doubt is delicious.Thanks for sharing this and have a great weekend. Also, thanks for stopping by and commenting on my blog. Nice to meet you! These sound delicious! Puff pastry isn't nearly as hard as most people think it is, it just takes a little time. 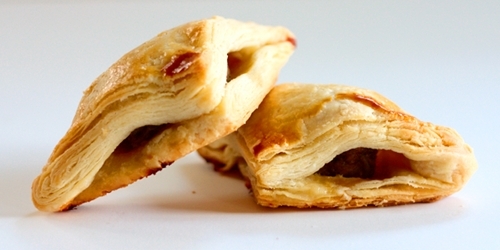 Store bought puff pastry doesn't taste as good because most of it isn't made with butter. There are a few varieties made with butter that are pretty close to homemade, but they can be a little hard to find. Thanks, Jen. Have to agree with you, it's not that difficult, but took time. I will definitely make it again.